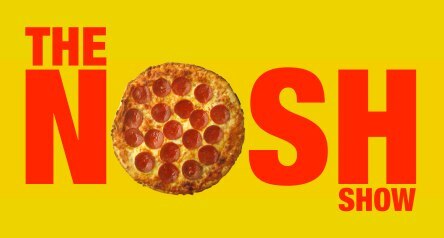 With the first of the summer holidays behind us, it's time again for the nosh show! Episode 5 of The Nosh Show is now available! Head on over to The Nosh Show website to listen and to see a complete rundown of everything we talked about. It's a neat episode that stumbles upon my love of pretzels... and ice cream... and pretzels and ice cream. I make a bad joke about oppressed bacon. I even work Jason Statham into the conversation. We may have talked about other stuff as well. Oh, and factoid correction: The average American eats 1-2 pounds of pretzels a year while the average person from Philly eats 12 pounds (reference). As always, I've made a few pit stops between episodes and the one I'll show you guys is my lunch time break at Burger King. 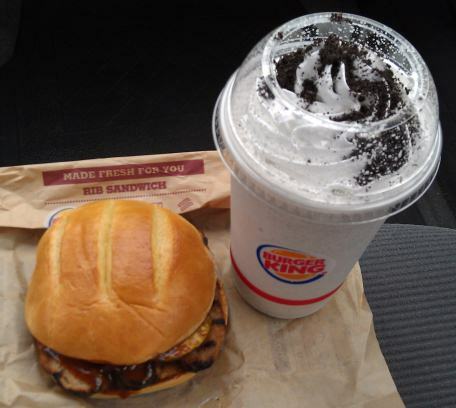 $7.74 got me the new BK rib sandwich as well a medium size of the new BK Oreo shake. Let's just say it's a good thing I had the shake because I definitely got my fair share of barbecue sauce on my over-processed slab of pork. The sandwich was decent and Ryan was right, the pickles do work here. I just wish the sauce had been a little sweeter and a little less spicy. Had I not had this shake, I would probably still be tasting the light burn of the sandwich. The shake is a pretty thing with its mound of whip cream and heavy sprinkling of Oreos. Ofcourse, I've never been a big fan of the stiff "whip cream" they serve up. I'm also not a huge fan of the shake's texture either. 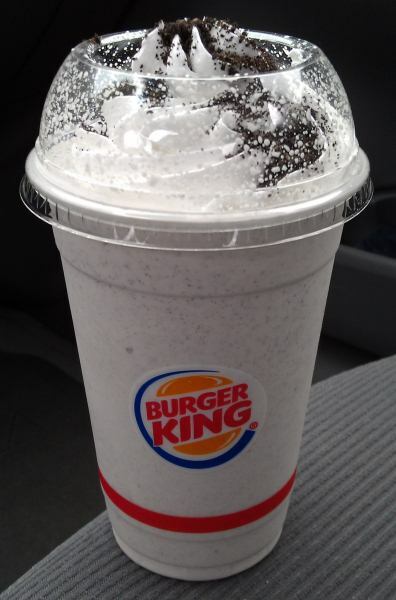 The Oreo bits don't mess much with the texture, but there is a certain fake-ness to the thickness of a BK shake. I had hoped for a bit more of a standard cookies & cream vibe with this shake, but the injection of Oreo cream flavoring doesn't let you forget that this is Oreo first, cookie second. It's not bad, but I'm not in love either (keep in mind my ultimate shake is a ben & jerry's sweet cream & cookies shake, so the bar is set insanely high when it comes to CnC). I too purchased the BK Rib sandwich and noticed it was insanely saucy and spicy. I have to say though, compared to the McRib it is waaay better!